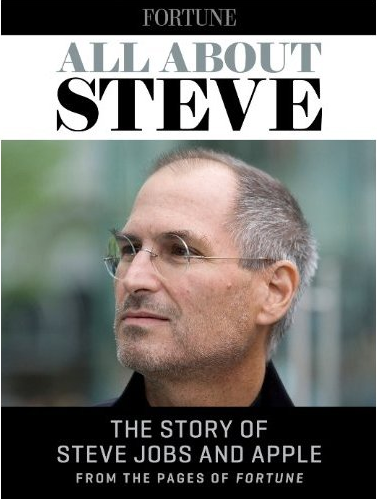 Fortune has released a Kindle eBook entitled “All About Steve, The Story of Steve Jobs and Apple from the Pages of Fortune. This is not to be confused with the authorized biography; that is not due until November. This book is written by the writers of Fortune and is based on past interviews and articles which appeared in the pages of Fortune. Steve Jobs’ legacy is clear: The most innovative business leader of our time, the man FORTUNE named CEO of the Decade in 2009. Now from the pages of FORTUNE comes an anthology of 17 classic stories spanning the years 1983 to 2011 about the cultural icon who revolutionized computing, telephones, movies, music, retailing, and product design. The Kindle book is available from Amazon.com at a cost of around $10. It does not appear to be available internationally at the moment.